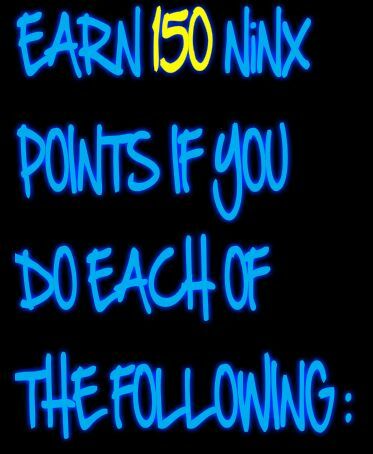 #NiNBlog "NiN Gaming Network and Company Studios Blog"
Attention #NiNGamers, @everyone please check this link out at http://ningaming.canadian-forum.com/t1264-short-on-ninx-complete-the-nin-gaming-scavenger-hunt-event-to-earn-10000-ninx-bonus-easy#6460 to complete the NiN Gaming Scavenger Hunt Event today if you are short on NiNX and would like to earn a free bonus of 10,000 NiNX in a very easy way. 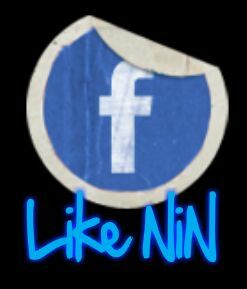 Thanks and #NiNFTW "NiN For The Win" o7 "salute"
This video was created by the #NiNGNC NiN Gaming Network and Company: A Gaming Software Apps Development Company and A Gaming Network Community. NiN Gaming "Ninjas Elite Internet Nation Gaming" is a global online network of more than 9 Ninjas Elite Clans established in more than 9 online multiplayer games. In addition to being a gaming network community, NiN Gaming is also a gaming software apps development company studios. 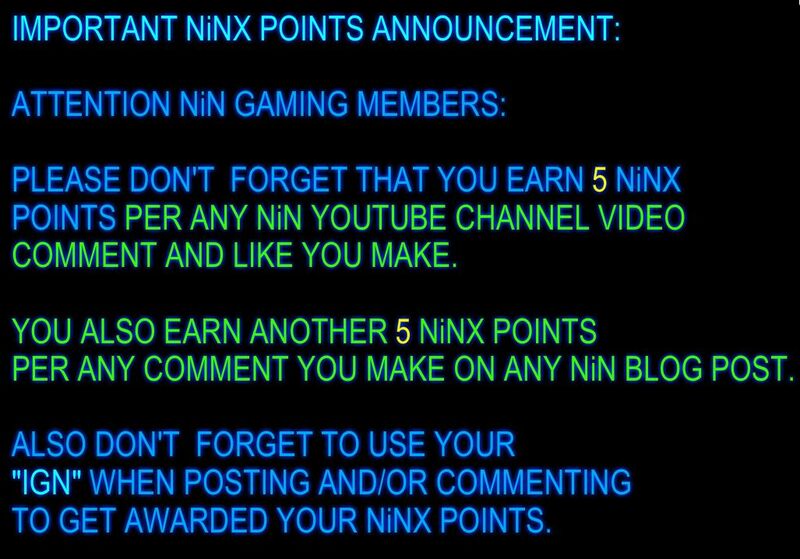 #NiNGamers can earn 5 NiNX per any comment they make on any of the #NiNGNC Blog posts and/or topics, as well as on any video that's published by our #NiNGNC Youtube Channels. Include your In-Game Name as your signature in your comments to be awarded your NiNX which can be used in the Clan NiNX Shop to purchase free gifts from the clan and more. @everyone consider donating to NiN Gaming. Since its inception, #NiNGNC has attracted more members which led it to provide more services for all #NiNGamers that require financial support. Become a #Premium-NiNGamer by donating 20 dollars to the NiN Gaming Community Fund that supports the NiN Gaming website(s), voice server(s), prized events, prized tournaments, free gifting and more. In addition to lots of operating costs that keeps #NiNGNC active and improving on a continuous basis. Make any donation on Patreon at https://www.patreon.com/bePatron?c=1314689 or https://paypal.me/ningaming or donate to eliteninjasclan@yahoo.com via Paypal. Thank you for your support. For Loyalty-Honor-Glory. NiNs We Salute You. 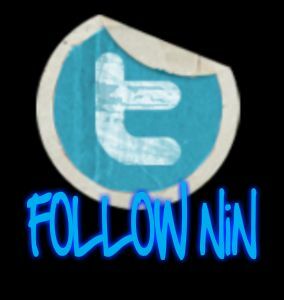 NiN for the Win #NiNFTW o7 "salute"
Labels: #NiNFTW #NiNGamers #NiNWOT #NiNWOTers o7 "salute"
This video was created by the #NiNGNC NiN Gaming Network and Company: A Gaming Software Apps Development Company and A Gaming Network Community. NiN Gaming "Ninjas Elite Internet Nation Gaming" is a global online network of more than 9 Ninjas Elite Clans established in more than 9 online multiplayer games. In addition to being a gaming network community, NiN Gaming is also a gaming software apps development company studios. 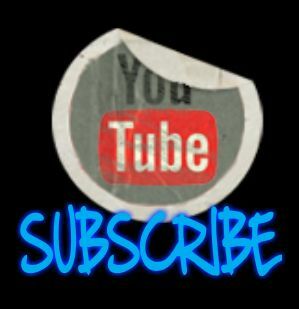 Like, follow, watch, rate and subscribe. 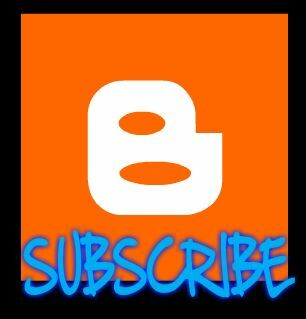 Expect a new video every week. Also, watch NiN Gaming LIVE! Streaming at https://twitch.tv/ninjastv and http://youtube.com/c/NiNGamingNetworkandCompany/live -#NiNGamers can earn 5 NiNX per any comment they make on any of the #NiNGNC Blog posts and/or topics, as well as on any video that's published by our #NiNGNC Youtube Channels. Include your In-Game Name as your signature in your comments to be awarded your NiNX which can be used in the Clan NiNX Shop to purchase free gifts from the clan and more. Make any donation on Patreon at https://patreon.com/ningaming or https://paypal.me/ningaming or donate to eliteninjasclan@yahoo.com via Paypal. Thank you for your support. For Loyalty-Honor-Glory. NiNs We Salute You. NiN for the Win #NiNFTW o7 "salute"
Labels: #NiNFTW #NiNGamers #NiNCA #NiNCAers o7 "salute"
World of Warships - Sinking the Yamato! Labels: #NiNFTW #NiNGamers #NiNWOWS #NiNWOWSers o7 "salute"